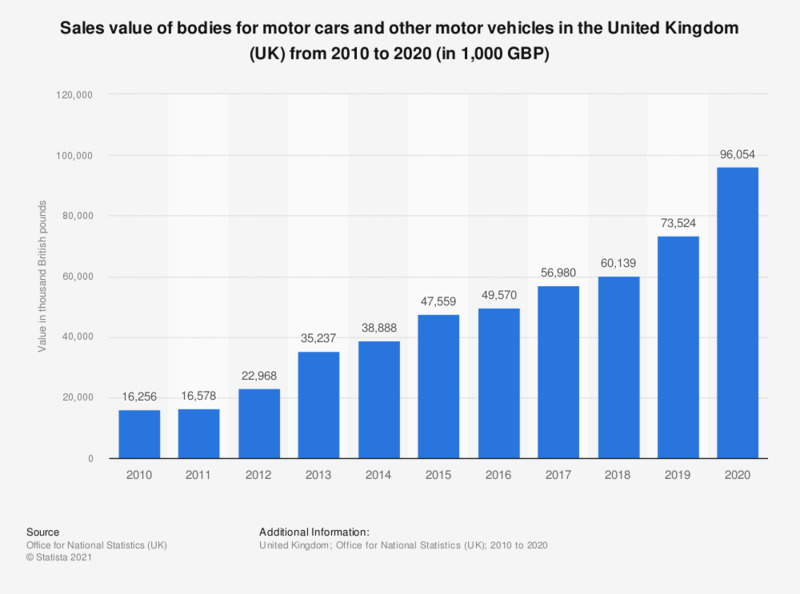 This statistic shows the sales value of bodies for motor cars and other motor vehicles based on PRODCOM estimates** in the United Kingdom between 2010 and 2017. The UK has experienced an increase in sales value over this period. The sales value was approximately 56.6 million British pounds in 2017. Bodies for motor cars and other motor vehicles principally designed for the transport of people, including for golf cars and similar vehicles, excluding for transporting 10 or more people. Everything On "Automotive manufacturing industry in the United Kingdom" in One Document: Edited and Divided into Handy Chapters. Including Detailed References. Statistics on "Automotive manufacturing industry in the United Kingdom"